Bankruptcy is a mechanism governed by federal law which allows individuals or corporations to obtain relief from debts that they cannot afford to pay, while ensuring that the creditors receive as much money as possible without damaging the debtor’s ability to afford reasonable living expenses. Before discussing bankruptcy in detail, it is helpful to define some basic terms. • Creditor – Person or institution that is owed money. • Debtor – Person or institution in debt. • Discharged Debt – A debt that is cleared/waived by a bankruptcy proceeding. • Exempt Property – Property owned by a debtor that cannot be sold during a bankruptcy proceeding under Florida bankruptcy law. 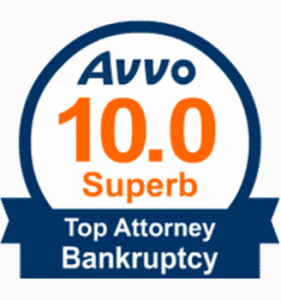 • Trustee – Court appointed official who evaluates and administers bankruptcy cases. Note: Discharge of any debt can be denied if a debtor commits a fraudulent transfer of assets, conceals assets or makes false statements to the court. If you live in Sarasota, Florida, your bankruptcy filing must be made through the United States Bankruptcy Court for the Middle District of Florida. Before you can file for bankruptcy, you must complete a credit counseling briefing session via an agency approved by the court. Then, you may file a bankruptcy petition with the court. At that time, you will pay a filing fee and complete forms/schedules to report your assets, creditors and other financial matters. The filing fee may be waived based on your financial situation. In a Chapter 7 bankruptcy, a meeting with you, the court appointed trustee and your creditors will be held to give your creditors an opportunity to ask questions about your finances, assets and liabilities. You will also be required to take a personal financial management course. After the trustee has processed your bankruptcy filing and discharged your debts, your creditors cannot attempt to collect any additional money from you. If your creditors make demands for payment or initiate law suit filings, you may file a motion with the bankruptcy court to intervene on your behalf. Learn more about the bankruptcy process. There are two types of bankruptcy proceedings that apply to most individuals: Chapter 7 and Chapter 13. The names refer to the chapter of the federal Bankruptcy code that governs each proceeding. Read more information about Chapter 7 bankruptcy. Chapter 13 bankruptcy typically applies to individuals who have enough money to pay their living expenses, but not enough income to completely/promptly pay other outstanding debts. In general, Chapter 13 is a repayment plan in which a debtor agrees to pay creditors part or all of his debts over a 3-5 year period. The debtor is allowed to keep his property as long as he makes all the payments according to the plan. Upon completion of the repayment plan, the debts addressed by the plan are discharged and the debtor has no further obligation to pay them. Chapter 13 bankruptcy also provides a few more dischargeable debts than Chapter 7, such as non-support debts defined by divorce proceedings, debts for willful damage to property and certain criminal fines/penalties.